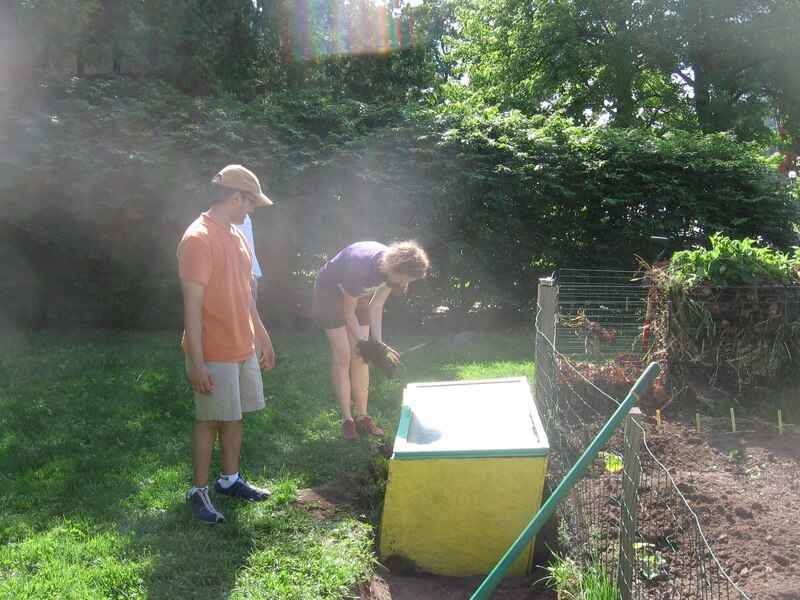 Last week we finished the installation of our two cold frames! They are finally done and in the ground. It was a lot of work, (the project began in late fall of last year), but they are looking great in their new home at the Ginsberg garden. If you don’t know what cold frames are, allow me to explain. Cold frames are used for extending the growing season of plants. Things planted inside the cold frames are protected from the wind and insulated from the frosty cold, thereby allowing the plants to live longer into the fall and winter. Cold frames take shape in many forms, some are made out of cinder blocks or straw bales, but our cold frames are large wooden boxes. Large windows are hinged to the top of our cold frames to allow the light to pass through. The boxes are placed 10” into the ground, to provide insulation for plants late into the season. The cold frames are painted bright yellow on the outside, and black on the inside to attract the sunlight. They will be used to extend the growing season past the frosty fall and hopefully into the winter. The idea is to have a later harvest toward the end of first semester, and also to experiment with growing other things in second semester.